The Edinburgh International Magic Festival is looking for competitors to enter into its inaugural magic competitions. All entries are on a first come, first serve basis. We have 3 spaces left for the 18+ comp and 4 spaces for the under 18 comp. All tickets are now on sale for all shows. 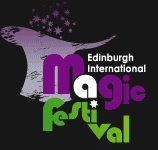 Ticket offers available to magicians can be found at http://www.magicfest.co.uk/ticket.html In particular is our limited 2 for 1 ticket offer on the first night of the festival – 7th July. For those interested in seeing a few shows, we also have bulk ticket deals available (details below). These can only be found on the website. All shows are outlined in the attached pdf programme. Please forward this onto your members. If you would like further paper copies of the programme please email back with your address and I will post them to you without delay.